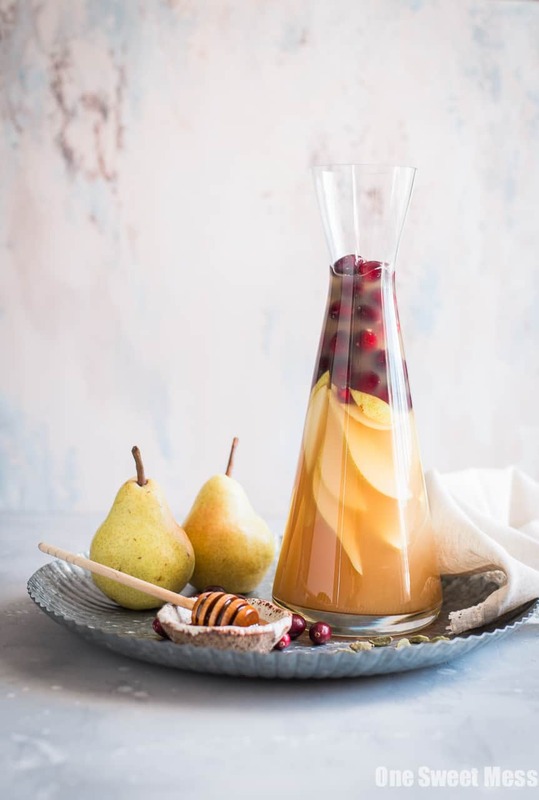 This Honey Cardamom Pear Sangria is a unique and festive way to celebrate the holidays without the hassle of having to work the bar. This delicious batch cocktail will easily serve your holiday crowd. The holidays can be a bit daunting with its long laundry list of items to check off, so the last thing you should have to worry about is what cocktail to serve at your holiday gatherings and how you’re going to serve it. The key to cocktail success during the holidays is choosing one signature drink that your guests can easily serve themselves. I’m taking the work out of cocktail shaking this holiday season with this Honey Cardamom Pear Sangria. This gorgeous batch cocktail is easy to make, easy to serve, and (the best part!) can be made in advance. The longer the sangria rests in the fridge, the better it tastes. Because we’re celebrating the holidays, I decided to take a classic combination like pear and honey and put a creative spin on it by adding a hint of cardamom. A little cardamom goes a long way. If you’re not familiar with cardamom, it’s a spice made from the seed pods of various plants in the ginger family. The aromatic pod has hints of citrus, mint, and subtle notes of smoke. The complex spice is popular in Indian cuisine, but it also works beautifully to add flavor to baked goods, chai tea, and, in this case, cocktails! I chose the aromatic spice because it pairs flawlessly with the sweet, floral notes of the honey simple syrup I made to sweeten the sangria. Honey adds a complexity of flavor that complements the crisp mineral notes of the Pinot Grigio and sweet, aromatic pear. When I’m making sangria, I like to make it a few days in advance to allow the flavors to mingle and get to know one another. It also allows the natural sugars in the honey to pull out the flavors of the pear, further flavoring the sangria. And, as we all know, flavor is king! Preparing the sangria in advance will free up your schedule to focus on the rest of your holiday to-do list. I like to have this Honey Cardamom Pear Sangria ready for when my guests arrive. I place the pitcher of sangria on the bar with a bucket of ice and festive glasses so everyone can serve themselves while I’m putting the finishing touches on the rest of the meal. I also like to serve it with a cheese platter or simple appetizer. This Brie en Croute with Honey Almonds, Cherries and Thyme is the perfect recipe for such an occasion. This Honey Cardamom Pear Sangria is the start of an epic honey-inspired holiday menu. You’ll find the full menu (from cocktails to dessert) with recipe links below and a printable grocery to make the holidays a whole lot easier. Get ready to win at the holidays, friends! Add water and honey to a saucepan. Bring the mixture to a boil over medium-high heat. Remove the pot from the heat and allow the mixture to come to room temperature. In a large pitcher add all of the ingredients, except the ginger ale. Refrigerate for 4 hours or up to 3 days. Serve with a splash of ginger ale. Click here for the printable version of the holiday menu! For more honey-inspired holiday recipes, visit honey.com. Actually freaking out over this. I am sangria OBSESSED – order it whenever I go out! And cardamom and honey are my JAM. This was MADE FOR ME. I am always looking for new holiday sangria recipes. This is on my must make list!! I’ve been looking for a new holiday sangria, and this will be perfect! So beautiful! thank you for this cocktail, love the ingredients in this, and as you suggest, easy serving for this holiday season, will put to good use! Pingback: Honey Chipotle Roast Acorn Squash | Healthy. Delicious.